Hilton Head Island is nestled in the lowcounty of South Carolina, where all the pleasures of island life abound - sunny days, sandy beaches, warm waters and breathtaking sunsets. We're not only about sea and sand, golf and tennis, we live in an area with a unique cultural heritage. That heritage includes welcoming new Islanders and visitors alike with open arms. Hilton Head Shore Notes is a part of the Island's entertainment heritage - women's a cappella music with a "southern touch." Just like much of the South we're unique, with a style and repertoire that's our very own. We invite you to join us at our performances and productions throughout the year. Hilton Head Shore Notes is a membership organization of female singers, who meet regularly to practice, perform, socialize, and have fun. We currently have over 30 singers of all ages, all walks of life, from Hilton Head and also nearby cities of Bluffton, Beaufort, Pooler, Savannah. We even have members who drive down from Charleston each week! The main purpose of Hilton Head Shore Notes is to get out and sing for our community. We sing at annual shows, a number of community events, and at an annual competition. We also perform Singing Telegrams around Valentine's Day and Mother's Day. We are available to sing at your next function or event. If you're looking for a unique musical experience to liven up your event please contact either Sherry Adams at 610-416-9213 or June Somers at 843-422-4799 for further information. In addition to sharing our music with others, another great passion of ours is learning more about the art of a cappella singing. Vocal instruction is a regular part of chorus rehearsals, and a very important component of the chorus experience. A couple of times a year, we will get coaching from a visiting master in the art of barbershop singing, where we learn many fabulous tricks of the trade. In the spring of every year, Hilton Head Shore Notes participates in the Region 9 chorus competition in Daytona Beach, FL. Competitions are a special time for quartets and choruses from our region to come together to sing for each other, and get some constructive feedback from a panel of judges. The winners of the regional competition in both quartet and chorus categories advance to the International Competition, which is held in the fall in a city selected each year. 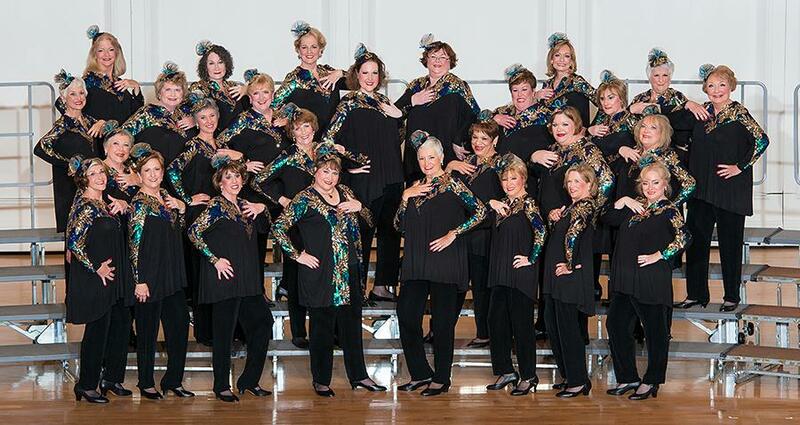 Hilton Head Shore Notes is a chapter of Sweet Adelines, International, a non-profit organization of approximately 20,000 members in choruses and quartets worldwide, with headquarters in Tulsa, Oklahoma. Their focus is to share the love of music - a cappella close harmony - referred to as barbershop - with the world. Hilton Head Shore Notes is committed to protecting your personal data and will use any personal or sensitive data we collect from you. In Europe, this is in line with the General Data Protection Regulations (GDPR). Hilton Head Shore Notes collects data from individuals to help us plan, organise and run the day-to-day operations of the group (e.g. co-ordinating rehearsals or collecting subscription payments) and to promote and market the group’s activities (e.g. marketing mailing lists and photography/video capture). This data will be used by our admin team to manage your membership with Hilton Head Shore Notes and to organise and run our activities. When you sign-up to our marketing mailing list we will ask for your email address and will use this data to send you information about our events and activities (e.g. upcoming events, latest news, etc). We will only send you information that is related to Hilton Head Shore Notes. (i.e. we will not use your data to send you marketing messages from 3rd parties). If you purchase an event ticket, or Hilton Head Shore Notes merchandise, or make a donation, we need to collect data on the person making the purchase. This data will only be used for administering your booking/purchase/donation, and will not be used to send you marketing/promotional messages from the group. The Hilton Head Shore Notes data retention policy is to review all data held on individuals at least every two years and remove data where we no longer have a legitimate reason to keep it.